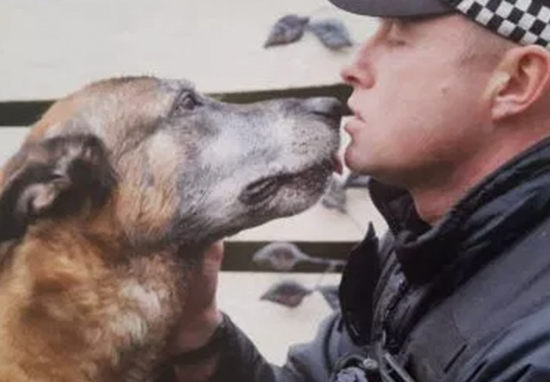 A heroic police dog has died in the arms of his handler and best friend, PC Steve Henry, after ten years of loyal service. 13-year-old Belgian Malinoishe Louis retired from his duties in 2015, after serving Northumbria Police for over a decade. Louis then went to live with PC Henry and his family in his Durham home for the remainder of his life. Before he was put to sleep, Louis went for one last walk with his beloved owner, who stayed with him until the very end. During his years as a specialist firearms dog, brave Louis was responsible for capturing hundreds of burglars and rescuing dozens of missing people. His greatest achievement was back in 2007, when he saved a missing woman from dying by suicide after picking up her scent. In recognition of this, Louis was awarded the ‘Police Dog Team Operational and Humanitarian Job of the Year’ at Crufts. I have young children and he was amazing with them. I got him when he was just eight-weeks-old and spent more time with him when he was my police dog than I did with my partner. I would spend all day with him and then when I was at home, or on my rest days, I would be taking him out for walks and he would be part of the family. He saved my bacon on more than one occasion and we went through a lot together. That creates a special bond. It is really sad that he isn’t with us anymore but it was his time. He had a great life and I am glad that he got to have three years of retirement. I got to have one last walk with him before he passed away and that gave me the chance to be able to say a proper goodbye. He was incredible at his job and got his licence to be a police dog at just 11 months which is very early. Louis was the first Belgian Shepherd that the Force had taken on and he paved the way for others as there were doubts as to whether the breed was suitable back then. He was involved in countless arrests but he quickly got a reputation of being able to track people even once the searches were over. Often we would be sent searching in one direction but would have no luck and the search would be called off. I would let him go to the toilet before heading back to the station and on more than one occasion he picked up the scent and found a suspect hiding in the bushes. He was a real pleasure to be around and there won’t be many other police dogs who achieve as much as he did. A loyal friend who was dedicated to serving others. Louis’ was truly a life well lived.